When we bought our house, it was brand new. We had .75 acres and about half of that was the pie shaped back yard. 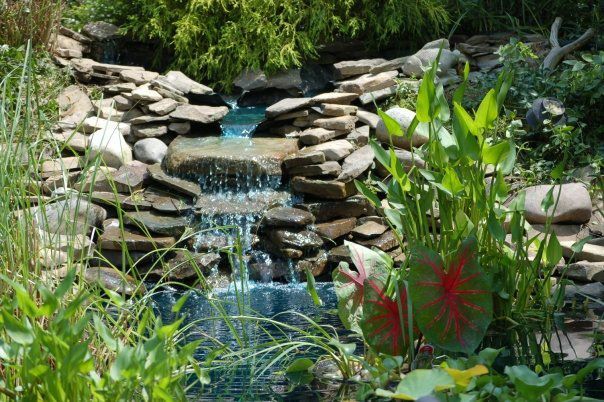 In 2002, my husband began to map out a free-form outline for a future pond, which he began digging out during the summer and fall 2001. We estimate it to be about 5,000 gallons. We didn’t have one tree or shrub in our entire yard. 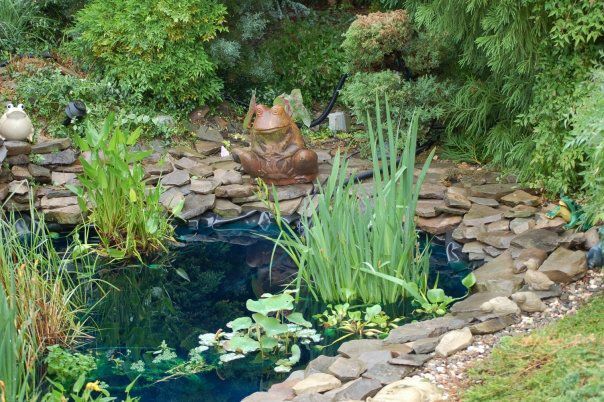 We had no experience with ponds – knew nothing about filtration, liners, skimmers, etc. We figured it out all on our own. Early pond. We ended up removing most of this landscape. A year later we added plants and bought four koi. Three of which still survive today. Figuring they were at least a year old when we got them, they are at least 12 years old! I also got the bright idea to buy some cheap goldfish, you know, the kind you win at a church carnival? Big mistake, for all they did was eat and poop. We also bought some other fish, none of which survived the year due to Blue Herons that would visit our pond, usually at dusk and dawn. 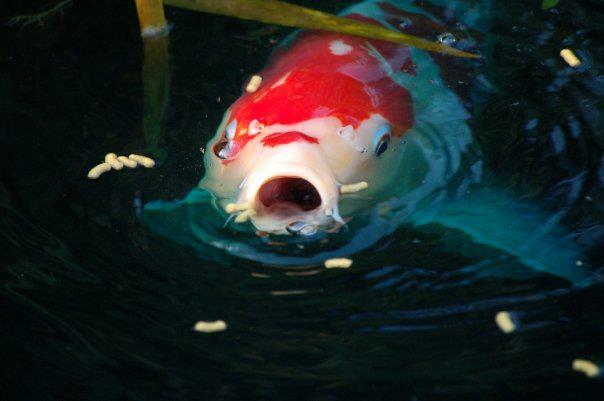 Somehow, the koi knew how to avoid being served as dinner! Later we added more plants. The only fish that reproduced were the goldfish. 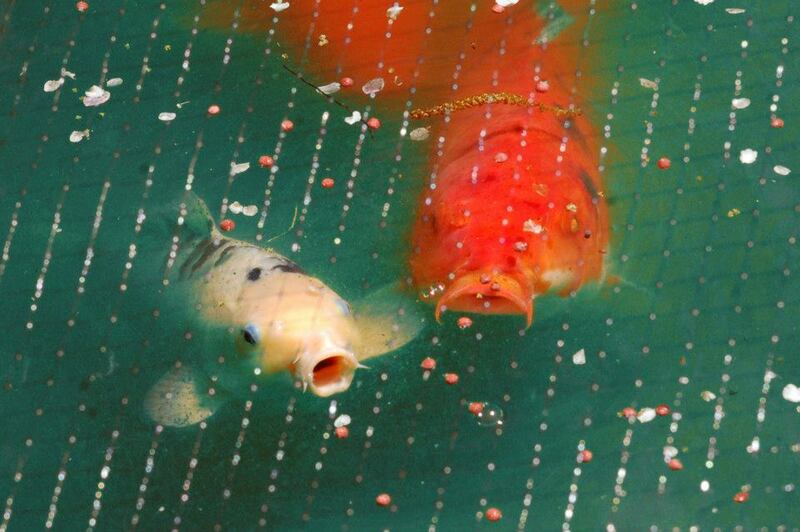 Goldfish and Koi, essentially both carps, are able to breed, but their offspring are rather muddy looking and sterile. We ended up giving away as many of these fish as we could. 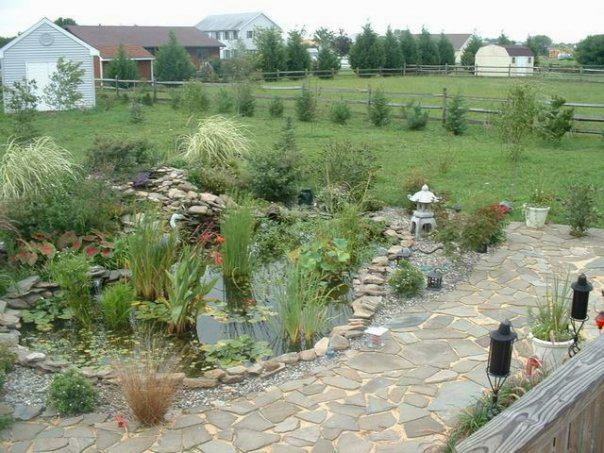 In 2003 or 2004 we put stone from our deck to the ponds edge, so that we could have a patio. 2003-2004. 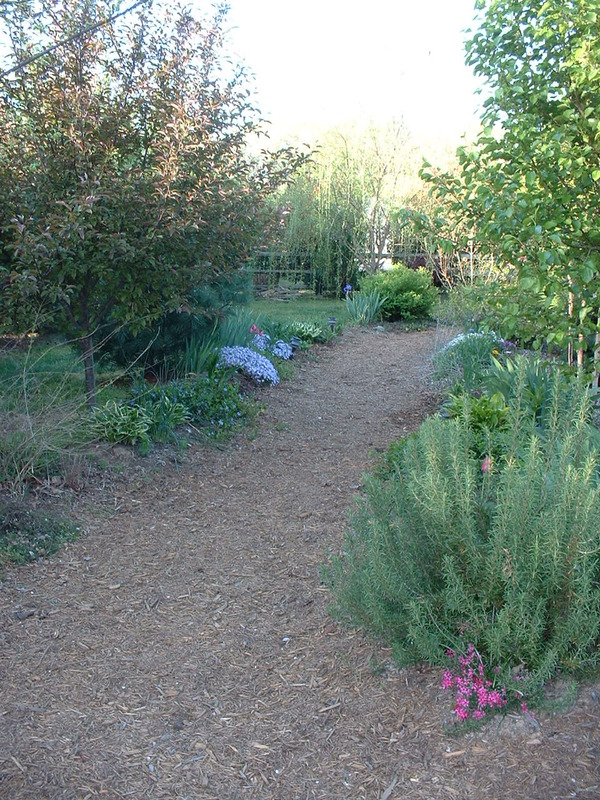 We eventually created two garden paths from either side of the stone patio that converge to the shed. 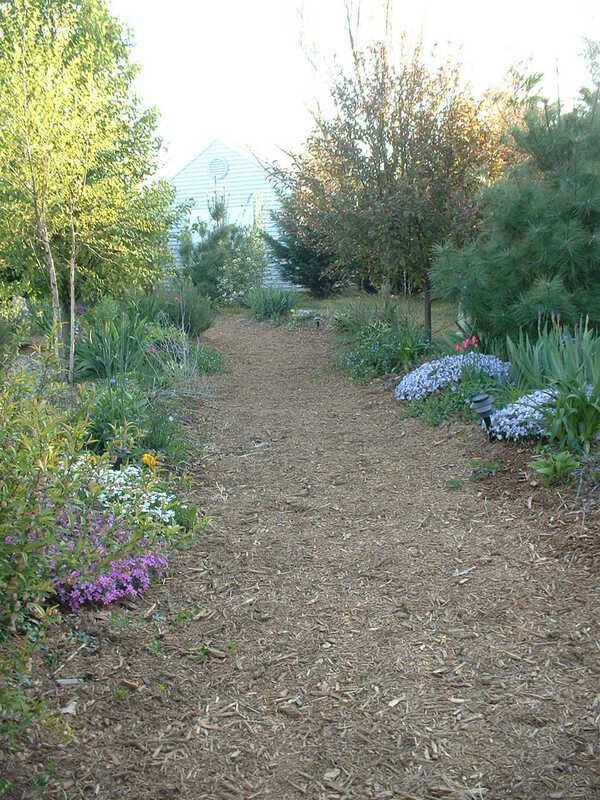 We also carved out garden paths to the left and the right of the pond, which converged to a point at the garden shed. Ichiban is one of our original four koi we bought in 2002. She is very friendly, lets us pet her and feed her. She is a piggy and a show off! A serious leak in 2009 forced us to drain the pond completely. We bought a kiddie pool to put the fish in, and it was a good time to weed out all the mutts. My husband put them in a cooler and took them to a natural pond nearby. I couldn’t bear to kill them. With fresh water, we decided to buy two more koi (after four years we had lost a white one due to natural causes). OhNo, a pretty yellow gold koi, stayed in the pond for about two months before a Blue Heron got to him. We found him alive, but floating on his side with a puncture wound.The other koi was a butterfly or fantail, almost white with some pale orange coloring around the head. We didn’t want to lose “Choucho” too! That is when we decided to get a net. We bought copper hooks and put them around the pond and their purpose is to hold the net taught. Once we put the net up, we also bought a lot of water hyacynths and parrots feather. That year, the vegetation just went wild. We could hardly see our fish, but the water was very clear. And something else happened, we started seeing babies! Breeding koi is difficult because they tend to eat their own roe. The combination of the net, lots of roots floating on the surface and vegetation in the pond for roe to attach, plus perhaps the addition of OhNo and Choucho (Japanese for butterfly)provided an ideal habitat to make koi babies. More than a dozen survived. We’ve given a lot away, but kept eight to enjoy. We see many of the characteristics of our original koi in this second generation. One in particular, we dubbed Rising Sun, for his nice round orange spot on the top of his head. I also like the name because it is one of my favorite George Harrison songs. He’s very shy and quick and its hard to get a picture of him. The pond net makes getting nice photographs difficult In the spring, the net catches various seed pods and leaves, and it can get kind of junky. We’ve got to figure out a way to vacuum this debris off. But it is necessary and acceptable if it means our koi are safe! 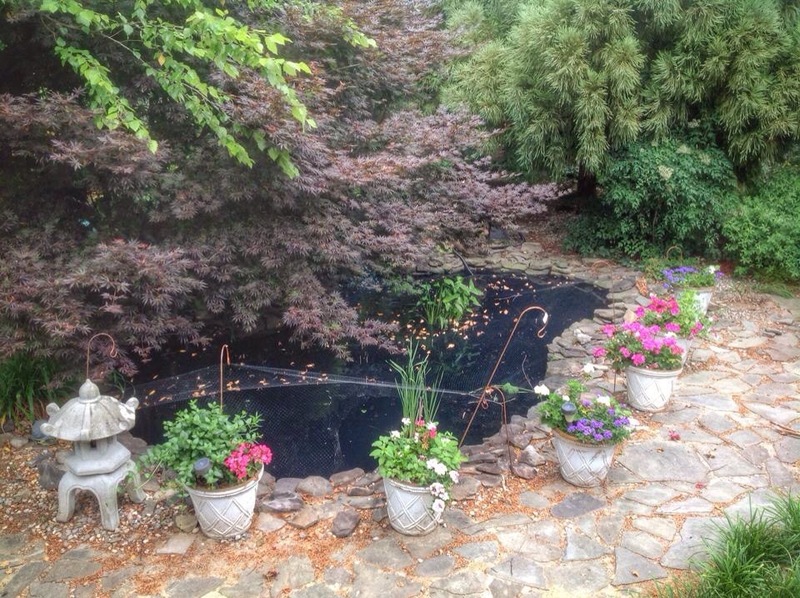 We changed the water in the pond this year (startling a mother mallard that nested at the pond’s edge and pump) and I made my husband take out most of the plants that had overgrown their pots, and which had also accepted many weeds. He removed them under duress, but we needed a fresh look. So we launched this spring with one pickerel plant, and plan to get some more. 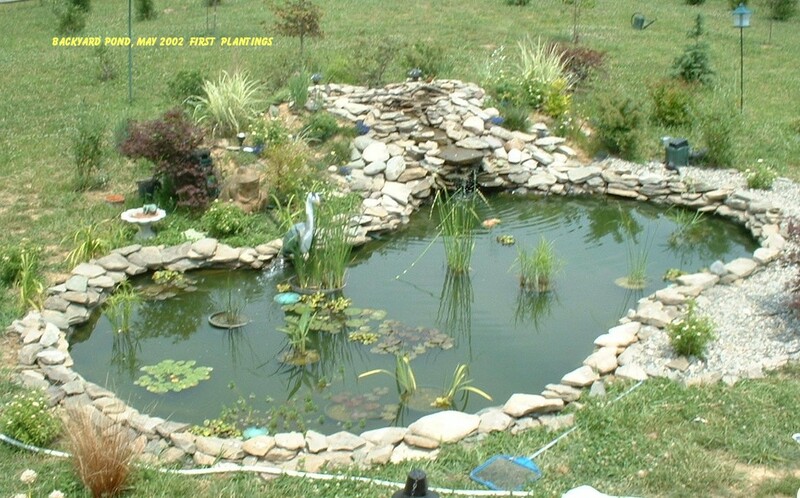 We need the plant life to fix the nitrogen and help shade the pond. Algae is a problem, though the fish don’t mind it.